(Newser) – A German dendrochronologist stumbled on something puzzling while gathering wood cores on the Norwegian coast in 2016: some trees were missing rings. "We got back to the lab and measured the tree rings, and saw that they were very narrow—in some cases nearly absent—for 1945," Claudia Hartl tells the AFP. A local scientist had a theory, she explained Wednesday at the annual meeting of the European Geosciences Union: that it had something to do with the Tirpitz. The 820-foot battleship was the largest in Hitler's navy, and the BBC reports it spent much of WWII anchored and hiding along Norway's coast, including in Kåfjord, where Hartl observed the tree-ring anomaly. But then Allied forces found it, and that's when the trees suffered, believes Hartl. What is the elongated ring of smoke? coming from 1/3 down the length of the ship and going upwards? Shoreline of an island? Cause? Wars are always bad for the environment. Yet another example of stupid German strategic thinking of that era. Germany should never have made big heavy battleships. It would never be able or willing to make enough of them to take on the gigantic British Royal Navy, and therefore making ANY was simply pointless since they could never be used in battle without being massively outnumbered and doomed. Any confusion on this subject should have been totally cleared away by World War 1, where Germany's enormous sacrifice of money and materiel to make a large battleship fleet was completely wasted, since the even bigger British fleet kept the German fleet bottled up in port, helpless and unable to be used. The Germans' one major battle with the Royal Navy ended in strategic defeat since despite losing fewer ships and men than the British they were still forced to retreat back to their ports. On top of that, the sacrifice involved in building these white elephants was even costlier for Germany after World War 1, since it was now much poorer thanks to having much more debt, much worse credit, much less foreign exchange reserves and hard currency, losing some national territory and all its overseas colonies, undergoing revolutions and political turmoil, paying reparations, suffering hyper-inflation, and then being hit by trade wars and the Great Depression. The resources poured into Bismarck and Tirpitz should instead have gone to something, anything else, especially more tanks, trucks, and aircraft. 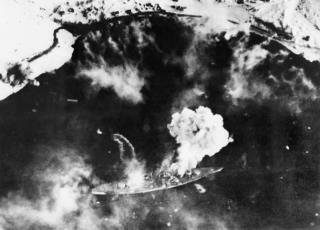 If confined to the Navy, more (and longer ranged, more advanced) U-boats, as well as fast cruisers able to outrun any battleship and armed primarily with anti-aircraft guns and, as a last ditch, torpedoes with ranges beyond that of British battleship guns (like the Japanese "Long Lance").